With a raft of additional characters and costumes. The latest King of Fighters is finally hitting PC next month, SNK has announced. It's the first in the long-running fighting series to make the transition to 3D, and while it's no Street Fighter V on the looks front, it doesn't look half-bad. Now, the older games have probably the best pixel art animation I've seen in a game, but given how many times those sprites were re-used over the years, it's about time for an entry sporting a fresh aesthetic. 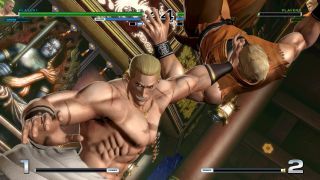 Released on PS4 last year, KOF 14's 3D character models were recently enhanced with a big, free update, and by the look of it, it's that new version that will be arriving on PC on June 15. You can find the game on Steam here. With the 20% pre-order discount, it'll set you back $47.99/£35.99 (for the basic 'Steam version', which comes with a couple of free DLC costumes), or $55.99/£44.79 for the 'deluxe pack', which whacks in four DLC characters, ten more DLC costumes, and a digital art book and soundtrack.